It was the first sail of the 2019 season and it proved to be a week full of activity for two of us taking the Coastal Skipper course and one preparing for the Yachtmaster exam. Surprisingly, the weather was absolutely glorious and we made passages to Burnham on Crouch, Titchmarsh on the River Twizzle, Shotley and we even had time for an unplanned coffee stop at Harwich Pier. The whole week was brilliantly overseen by Tom who, as always, brought knowledge, humour and good food together to make a superb start to the years’s sailing. We also had the added pleasure of being joined by Mark for part of the course. I have two abiding memories of the week, first, the companionship that seems integral to all Shearwater courses and second, a hard won lesson to remember to check precisely when the tide turns when bringing Shanti alongside a pontoon dock. Like many things in life, there is a right way and a wrong way to do it - lesson learnt and I am now looking forward to taking the Yachtmaster Theory course with Shearwater later in the year. Going out backwards every time is the way! No problems so far! Might also want to talk to you about doing my offshore qualifications if that is ok.
Just wanted to send a huge thanks to yourself and Tom for a great couple of weekends on the water. I'm thrilled to have my day skipper license now and definitely looking forward to building up some miles with you again next year - I'll keep a lookout for dates on the website, but do feel free to get in touch as and when new trips launch. As a complete newbie to sailing, I realise I'm probably not the easiest person to teach, so I really appreciate all your patience and hard work getting me through the course. Tom was absolutely brilliant throughout and great fun too, so I'm afraid I don't have any constructive criticism to leave - you're both doing a wonderful job! I wanted to say thank you to Tom for the superb week we had in August on the cross channel passage. What an absolutely brilliant way to do the Day Skipper practical beginning with a 16 hour crossing to Oostend and to sail along the Belgium and French coast covering 230 nm in all. Tom’s teaching style is exemplary - show and tell - followed up by supportive comments that build confidence quickly and seemingly easily, but always resulting in an appetite for more learning and more sailing. The unsaid part of the experience is how a disparate group of people quickly meld into a supportive group that adds enormously to the experience. By the by, Tom is also pretty handy in the kitchen. I look forward to more time with Shearwater and the lovely Shanti. I am so sorry it has taken so long to get the evidence to you that we had benefitted from your excellent teaching at Easter! We had a fabulous (and eventful at times) holiday in the Northern and Southern Ionian and met another of your pupils - Tony - I’m attaching a photo of him with us all as well. I am sure we will be back for more training but this year. Thank you again for a wonderful introduction to sailing. I just thought I'd let you know what a great time had aboard Shanti 2 last week with Tom and crew. The whole week was filled with great sailing, very informative training and great food. Tom was a brilliant skipper showing a lot of patience with us all and communicating the RYA syllabus in a very clear and concise manner which was easy to follow and understand. He was also a great host, cook and source of knowledge and made the whole experience very safe, relaxing and enjoyable. The crew were a great mixed bunch and we all got along well partly due to the relaxed and safe environment aboard. I learnt a lot during our 7 days cruising around the English channel and it has increased my appetite to learn more and progress through the RYA sailing scheme. Many thanks once again for a great weeks sailing and great company too.I look forward to seeing you both in the not too distant future. The trip was outstanding in all areas. I could not fault a single thing and will not hesitate to return when the time is right. Although I will be sailing my own boat from St Katharine Docks to Levington and back soon with my friend Graham who is a yachtmaster instructor, I have gained a lot of confidence on your course and do think I could do the trip even without Graham if the conditions were fair. Tom did exceptionally well in skippering the trip. Given Tom's experience and ability, which cannot be questioned, he was also able to keep everybody on board entertained for the six days, which I know from my tour guiding experience is not easy, especially when everyone is occupying such a small space. There were plenty of entertaining stories too, not least holding tank disaster somewhere in the med! I will happily recommend Shearwater Sailing School to others and hope to return very soon. Having just completed the Day Skipper practical course, I would just like to once again say a big thank you to both the school and especially Tom for the excellent tuition. His training style is excellent, keeping everyone involved and interested, installing confidence in all of the “students”. Will definitely be back for more courses and other events. I've just posted off my RYA feedback form which reflects how much I enjoyed the course. I'm also recommending you to my brother-in-law. He lives in France, has just retired and is keen to do a Day Skipper course. Once again thanks to you and Tom for a very enjoyable course. It ticked all the boxes! Thanks very much for a great coastal skipper course. I learned a lot; the environment in which to learn that you both created was excellent. On top of that your messages were consistent and succinctly put across with a great deal of patience too. Shanti is a great boat so all in all I could not have asked for more. We chatted about my next step towards Yachtmaster Coastal which would be to do the prep course your are running on which I would like to book onto. I should like to thank you very much for your ICC course this month (April 2018). As a latecomer to owning my own sailboat, and quite "long in the tooth" now (I think this means an "old geezer") I found your course rejuvenated me considerably. I learned such a lot in such a short time. Your patience and your considerable teaching and sailing skills sent me away with big "springs in my steps". That is a great achievement for me given that my wife complains about me grunting and groaning as I get up out of chairs. Clearly, you should have an honorary degree in physiotherapy and psychotherapy. Joking apart, you provided a thoroughly stimulating learning environment for the ICC course. And the same applies to the beautiful countryside and waterside at Woolverstone Marina. Thanks very much for the update. As you will no doubt have realised, the week surpassed my expectations and I came away from it with a huge amount of confidence and many new skills. Vernon is an excellent instructor (but you already know that) and his ability to keep the conversation going as well as a sense of humour and an inexhaustible supply of anecdotes made the whole event very special. I just wanted to pop you an email as a follow up to the trip we did last week. I’d like to say how great Vernon was and how good I found the whole trip. It’s given me a massive confidence boost not only with the sailing aspect, which is what I really wanted out of the course, but also it’s opened my eyes to how open and inviting the yachting community really is. Vernon had a lot of information to give which superseded the syllabus, was always there to answer a question and constantly challenged us all to think on our toes. Just to let you know that I had an excellent time last weekend, Tom was excellent, the only downside was the lack of wind, preventing us from actually doing much sailing, but I guess it’s a good excuse to do another weekend! A quick note of thanks for all the tuition, patience and professional advice that allowed me to earn my Day Skipper ticket. A thoroughly enjoyable experience. I enjoyed the Day Skipper course immensely and it has really boosted my confidence with handling a yacht and navigation. Tom is a first class instructor who maintained a really fun atmosphere on the boat while delivering a professional and safe course and sharing his knowledge and experience. Firstly I'd like to say a massive thank you for making us welcome from the onset, you created a friendly atmosphere from the start and made everyone feel at ease. The friendly atmosphere and your approachable personality made for a thoroughly enjoyable course, it felt like a holiday with a bit work. 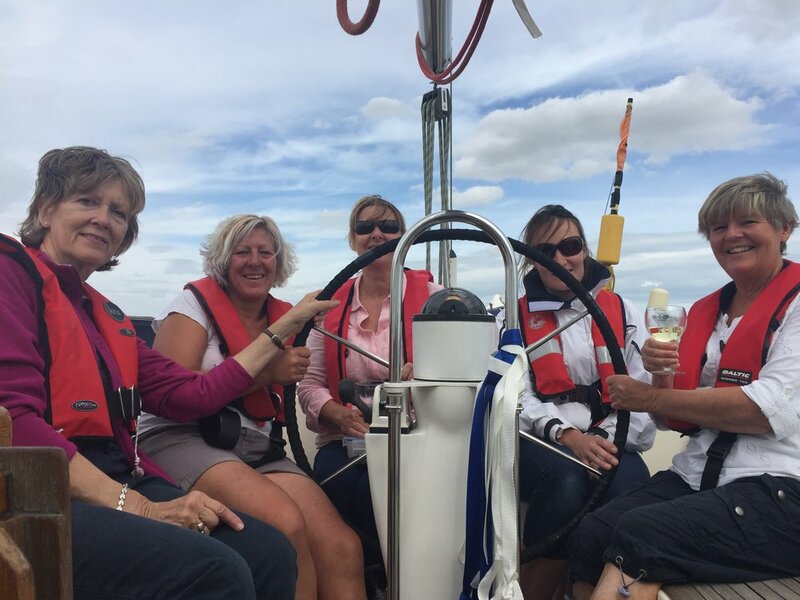 We thoroughly enjoyed sailing with you and wouldn't hesitate in taking on the next level of courses with you and Tom and also would not hesitate in recommending Shearwater Sailing School to anyone wanting to learn to sail. Thank you also for showing us the local area for us to sail and for all the helpful tips, much appreciated. I honestly look forward to the next time we can get out on the water with you so in the meantime if ever you need an additional crewman let me know. It was an absolute pleasure to meet you last weekend on my Day Skipper course. Thank you very much for your hospitality and letting me stay on board both Fridays. I am very impressed by your sailing school and the way the course is taught. I am also very impressed with Tom's instructing skills. He is a natural! It was a great experience and more importantly great fun and I will definitely be looking to come back early next year to further my knowledge and get more sailing experience. I think my wife Amanda may also be interested in coming along for a Competent Crew course. Thanks again and look forward to seeing Shanti II again very soon. Just a quick note of thanks for a fantastic week aboard Shanti II. The course was great, and Bev was a fantastic instructor. She really understood the strengths of each of us after just a few hours together and put together a really well thought through week of training (and fun! ), that stretched each of our abilities perfectly. I'm amazed at the progress I made in such a short space of time and very happy to have earned my day skippers ticket. Please do send on my thanks to her. Hi Mark Just completed the day skipper course in August 2017. I just wanted to let you know what a great job you guys do .Bev was a fantastic teacher and we completed the course with a great sense of achievement.The mixture of fun incorporated in the learning was a fantastic combination. I thank you very much and look forward to sailing in the Med !!!!! Best regards Mark. I just wanted to say thanks for what was a brilliant course. Vernon was a real inspiration, a great instructor, very calm disposition and genuinely nice chap too. I will certainly be looking to do some more training with you. Our sincere thanks again for a fun and informative weekend excursion. The core values of Shearwater were transferred under the full glory of the Suffolk sun. I wanted to mention how much I enjoyed and thought how well the VHF course was presented. Further more I also wanted to highlight the amount of knowledge and experience I gained from the Day Skipper course, it is very difficult to find an instructor who has the time and patience to teach a wide range of experience and produce an efficient and effective crew. The whole experience has increased my confidence and I can't thank you enough, it has given me the boost to look forward to future courses and improve my sailing ability. We had a fabulous day. Tom is a credit to the company. He impressed everyone with his easy company, great teaching style and ability to instill confidence in the greenest of sailors. I'd nearly forgotten how good it is to be on the water! Ho, well, we had a REALLY great time. I said to Bev she instructs without appearing to instruct, it’s an art; you find yourself just doing it! The kids were getting stuck in and Françoise did loads of things and all really well, calmly, like she’d been doing it for ages. My problem now, going to have to spend some money on a boat! Kids looking at doing DS theory too! Yup, the progression is palpable, very grateful to you and all at Shearwater. I had a first class training week with Tom and Mark - Highly recommended and a wonderful sail to Brightlingsea and back. Many thanks for operating an excellent and enjoyable weekend course. I was very impressed with your teaching style, Tom and your calm and efficient way of handling a diverse bunch of students.. I was surprised how much I learnt despite having sailed all my life! It was very instructive being made to pre plan each manoeuvre and give the rest of the crew clear instructions before starting - a fault of mine which my wife has been pointing out to me for years! Thanks again for an excellent weekend. Just wanted to touch base in order to thankyou for the fabulous five days of sailing instruction over the last couple of weekends. I expected to come away fully equipped with enough knowledge to be a competent crew member. What I didn't anticipate was the excitement of working as a team with other wonderfully enthusiastic crew members. It felt more like a holiday than a course. You also managed to order perfect sailing conditions. Simply amazing! Learnt lots even though I did the same evening last year. Things are very different at night!! Mark is an excellent instructor and have been on many of his courses. Excellent first night sail experience. An excellent night Sophie. Thanks for the opportunity. Please pass on my thanks to Mark the others. Bev was great and I really appreciate how she built up all our confidence with just little things without us realizing that she was doing it. We all had smiling faces when we returned - sign of a good sail !! I think we made a good team, it would be nice to do it again. I thought the day was great. Bev is fab - she set the pace just right so that we all got to have a go and build confidence without it being stressful. Lovely to have a girls day out and meet new people. Last Saturday was very enjoyable, the weather was wonderful (well at least till 5 pm) and it could not have been a better day for practising sailing. The wind not too strong (Force 4/5) – ideal conditions all in all! Personally it was only the second time I had managed to go sailing this year having had some problems getting started with my boat and I really appreciated going through some of the practices of hoisting sails, sailing, picking up a mooring, etc….Bev. was super and you could tell she is very experienced and confident. I certainly will remember some of her advice like not too get too close to a buoy and the rules of the river for ex. She did not make us feel self-conscious at all, was very understanding and uncritical. She had to be with me as I was really tired not having slept very well the night before!. So all in all I would recommend this course to anyone needing a bit more practice and confidence on a really nice big boat or thinking of taking up sailing as a hobby. Thank you again Sophie for having told me about this course, it was also nice to meet you and the other girls. I had a FANTASTIC week’s course, and the responsibility for that must largely rest with Bev, who skippered and instructed in a seriously professional manner, whilst at the same time making the whole process seem like a week’s holiday!! All 5 of us students had a ball from start to finish, whilst at the same time learning a whole mass of skills that we would have taken years to accumulate otherwise. By the time that we had finished and been through the (small) stress of the wash-up and interview, I would happily have stayed for a second week if one had been available. To have earned (I hope!) a Day Skipper’s ticket as well seemed like an extra bonus rather than the objective of the course, so well did we all get on as a team. Just wanted to say what a great day I had the other day with Vernon. It was a delight to be on board Shanti with him and the rest of the students. I am now looking at the possibility of doing further courses with you. Many thanks from Abby and myself ‎for the session on Lobo yesterday. We both really enjoyed it and learned a lot. I was fortunate to run into Mark Lewis at a Clipper-Connect event at the Henri Lloyd showroom in London last February. After presentations by HL and winning 13-14 skipper Eric Holden, I got talking with Mark and expressed my ambition to turn my Clipper experience to good use and getting my RYA Yachtmaster certificates. He invited me for Coastal Skipper practical course with his school Shearwater Sailing near Ipswich. After the level training weeks up and around the Solent with Clipper, I thought it would be a good idea to try some other UK waters and I scheduled for the week of 9 - 13th of May. The Coastal skipper course is a great opportunity to learn new elements of sailing. Experienced salty sailors, as we are now, on the ocean we never much came across shallow waters, tides, markings, traffic, positioning, signal, course plotting etc. etc. The ocean generally is deep, the course more or less is the same for days and other traffic would not be around for weeks. Sure, with Clipper, we touched upon everything required sailing a yacht; safety, engine, crew management, victualling, anchoring, navigation etc. But on a Clipper boat, these tasks are allocated. It's much different to do them all by yourself as a skipper on a smaller cruising yacht. So there is much to be practiced. Sailing with Shearwater in Ipswich was a great pleasure. The Hallberg Rassy yachts are of great quality (though only 36' and much slower than a 70'). And it was nice to do this course with yacht owners, who bring completely other skills to the week. Clearly, as Clipper crew, there is little to be learned, as far as sailing is concerned. But for all the rest of it, it is an intense course. Manoeuvring in tight marina spaces, planning with the tides, handling the VHF, maintaining the engine, understanding the lights of working ships, practicing the rules of the road. The whole coastal skipper syllabus is covered within one week and the Suffolk coast line offers plenty of challenges to learn. 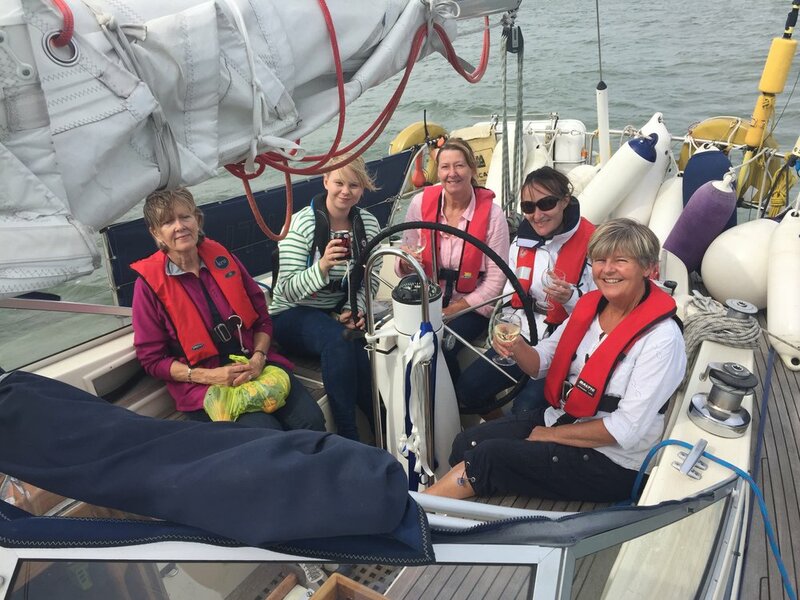 My experience sailing with Shearwater Sailing has taught me, that it is definitely worth signing up for any of the RYA courses to compliment the Clipper experience. It is my ambition to obtain Ocean Yachmaster and find work in the sailing industry. Mark Lewis and his instructors at Shearwater sailing certainly have helped me along that path in a professional and enjoyable way. Hoping to see you on the waters somewhere. Vernon was wonderful, cool, calm and collected. Extremely patient and instilled confidence.I was also pleased that it was more relaxed than expected. I thought it would be Go Go Go. Just to say many thanks for a really enjoyable two days sailing. The added bonus was that of learning without really realising! You have a really good approach to students and would be sailors - so thank you. Choosing a sailing school with no prior experience can be a risk, I need not have worried. The boat was clean, perfectly maintained with not a single failure all week despite us pushing her at times and the food was good and plentiful. Bev was brilliant! She knows her stuff and has that rare ability to balance stepping in when necessary whilst allowing us to make mistakes and learn from them. I think it fair to say all three of us wanted to carry on for another week. Your whole set up seems to have the right mix of professionalism and fun. I was delighted to be awarded Coastal skipper. Just returned from 5 days sailing with Vernon. A fantastic course, felt that I was taken out of my comfort zone, and I have grown in confidence to take on the next challenge. Vernon should come with a health warning, as I have never laughed so much...! I just wanted to say a very big thank you from Nigel and I for the 2 days Start Yachting course that we took part in. We thoroughly enjoyed both days and it was a pleasure to get to know you and the other members of the crew. We learnt so much and are both grateful for your calm and patience. I chose your school because it seemed supportive and a lot less intimidating than some of the others that I looked at and I was not disappointed. Thanks Mark again for your fab stories and tuition. I really enjoyed the couple of days. Tom was an excellent instructor and great company as well - a real "chip off the old block". Please reiterate my thanks to him. It was also fun to meet up with you and the boys down at Harwich. Hope you had a great afternoon. Thanks for a top week - fantastic sailing, great company and a clear benchmark for future cruises! I Just wanted to say a big thank you to you, Vernon and Bev for all the training input for the Yachtmaster offshore exam. I certainly felt challenged! Thank you and Shearwater sailing once again for all your support and guidance. Massive thank you from all of us, we all had a great time and learnt so much. Shearwater is not only where I learned to sail; returning to them for all my RYA courses, but more importantly, where I grew in confidence. Their approach is one of inspiring enthusiasm for being on the water and to give you challenges that result in replacing any self doubt in your ability, for a firm belief that 'Yes I can do it'. Although a late comer to sailing, it is because of Shearwater that I became completely hooked and wanted more; it is because of Shearwater I that I signed up for Clipper. I want to tell you how much I enjoyed the DS course ,it was everything and more that I thought it would be ....must be something to do with turning 50 in August and feeling the sailing bug really kick in! I also want to say what a great instructor our lovely Skipper Beverley was. She was totally professional and taught us all with such aplomb and also just as importantly she was such great fun... !! So thank you once again for a really good course . Just wanted to let you know about the recent trip to Belgium and Holland with Vernon what a great time we all had. I learnt an awful lot during the 7 days, enjoyed seeing several new places and managed to get experince for my Coastal skipper, which was ideal. Vernon's teaching style was spot-on for me, I'm a huge fan of the see / do / teach method and the the lecturettes were handy for throwing ideas around and reinforcing knowledge. I also enjoyed Vernon's sense of adventure with an emphasis on safety; we all had a blast.